At the 2018 European Energy Award EEA Annual Event, which took place on 5th and 6th November in Baden, Austria, MEEMP Project Implementation Assistant, Ms. Tanja Cvjetkovic, had the pleasure to present the project at the EEA General Assembly meeting. 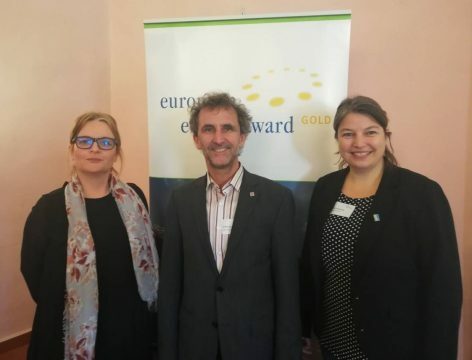 In 2018, 42 municipalities were (re)awarded with the European Energy Award Gold. Apart from the award giving ceremony, the Annual Event hosted the EEA General Assembly meeting and the workshop “Guaranteed Energy Saving – Contracting Solutions for Communities in Practice”. Ms. Cvjetkovic had an opportunity to present the MEEMP at the general Assembly meeting and in her addressing she highlighted that through MEEMP project four Serbian municipalities will pass EEA procedure and will be awarded depending on the score they achieve, which was warmly greeted by the General Assembly. Ms. Cvjetkovic used her presence at the EEA Annual Event to learn about experiences of municipalities from other countries and establish contacts that can be useful for success of Serbian municipalities on the EEA journey and MEEMP project in general.